This very successful Sabert range consists of 4 Ultimate platters and Lids. This new solution meets the latest trends in food service offerings of small or individual portions and offerings of desserts are expanding. Because the at-home market is growing, convenience and retail items are likely to require new recipes and packaging. The success of all take away offers is increasing. Take away implies safe transport of prepared meals. Outstanding platter quality means it can be served straight to the table. 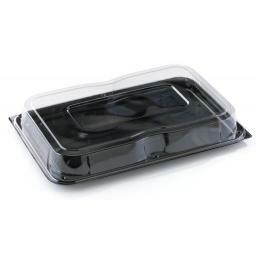 The lid fit guaranties perfect taste and freshness. The smallest Ultimate is ideal to separate a specific portion (gluten free, vegetarian, etc. ).